I had this book off of my shelf and on the coffee table, which to me means that I will usually be getting around to it within the week. That’s about how long it was there before I actually 1. Had time to read it and 2. Actually felt like reading something. It took me 3 or 4 tries reading the first page before I got into it. And then I really got into. I finished the book in a day and a half. That is relatively quick for me. I just needed to know what was going on. Why were they in The Maze? Why did Thomas feel like he had been there before? What were the other Gladers not telling him? Who was this girl that showed up the day after Thomas? But mainly, what was going on? Even after finishing the book, what was going on is a main question. I did not feel a connection to the characters, and that’s why I only gave it 4 stars instead of 5. Because of the fact the course of the book takes place within two weeks is why I felt there was no development.. Other then that the book was good. The set up was nice, the characters had potential, and hopefully reach that potential in the next book. The mechanics of the book are pretty simple. Thomas gets sent up this elevator shaft to a glade like area which is in the middle of a huge maze with no seemingly way out. Each boy has a job. They do the job. The Runners try to find a way out. This was how it was for the two years before Thomas showed up. Then the day after he shows up the first and only girl, and the last person ever to come to the Glade, comes up The Box. She is in a coma for a couple days before she wakes up. Upon waking up, a few things happen. The “Sun” disappears. The walls no longer close. Oh. And her and Thomas have a telepathic connection. Because of the “Sun” disappearing there is even more of a rush to figure out a way out of The Maze. Thomas realizes that he needs to be stung and go through the Changing, which brings back just enough memory for them to figure out how to escape. So they do. But not everything is peachy keen after that. Of course, I wouldn’t know. That is part of the second book. 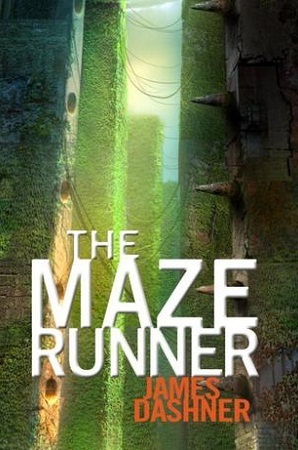 This entry was posted in Book, Book Review and tagged book, book review, book reviewer, books, james dashner, maze runner, review, reviewer, reviews, the maze runner. Bookmark the permalink. Thank you. And followed. 🙂 If you could follow back I would appreciate it.